Seven years ago we bought a 1975 Catalina 27. I named her the Saucy Sue (another Black Adder reference). She was the perfect antidote for a working life spent in front of a computer. I also saw it as a good way to spend time with my family and learn some new skills. The Catalina 27 was a perfect first boat; easy to handle, very forgiving and inexpensive. We would Race her on Commencement Bay from our Tyee Marina Moorage. The Saucy Sue was a great first boat and we did spend some weekends on her but as a practical matter, cruising for an extended period with four people on a Catalina 27 is just under three people too many. Certainly many people make lengthy voyages in boats of this size and smaller, but we wanted a boat that could truly be comfortable for our family as we explored the Puget Sound. Glad we could bring back some memories. I still miss the Saucy Sue. She was so easy to take out for a sail. and inexpensive (relatively) to maintain. Our boat had been at Tyee since 1989 I believe. I bought her from a Boeing engineer that sailed her down the east coast and then shipped her to Puget Sound. She was raced often and was pretty fast in the right hands. Just about the perfect first boat. Wow! How interesting! My husband and I had a Catalina 25 once upon a time and sailed the Chesapeake Bay for 10 years. Had a great time. Good weekend getaway. Good luck on your sailing adventures. Thank you Margareta. We learned so much on our Catalina 27. 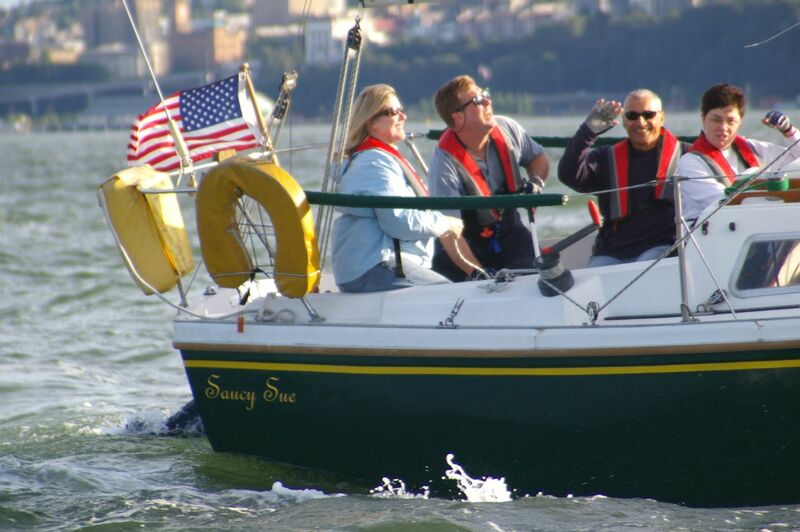 It was really the start of our love affair with sailing and brought our family closer together. We were recently in and around Washington D.C. and I can see why the area is so popular with sail boats. Shoal draft, of course.